I have never seen this one before, anyone else? Also taking the wood grain into consideration! Nope, never seen that one before. Very interesting, thanks for sharing! Possible its donated from a 1903? Is it my eyes or does the second guys M1 Thompson have a grip? It appears to be the more common mod. And no, I've never seen the banana clip grip before. Perhaps these two are in the R&D platoon. God only knows what the Garand looks like. Ha! That's a new one on me too. Verrrrry interesting, as Arte Johnson would say on Laugh-In. No buttstock that I can see either. 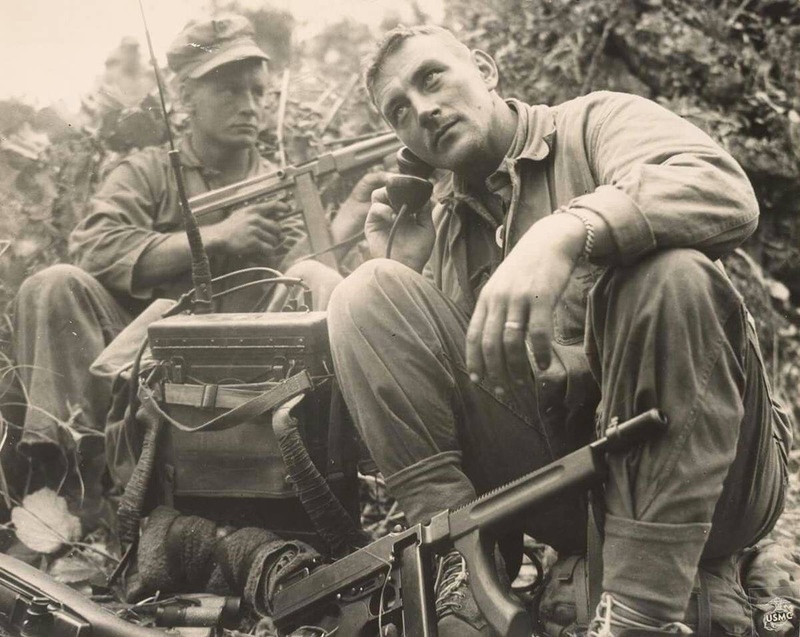 Looks like there's a Garand sitting by the radio guy too. As bug sez, what does THAT look like? And how is that banana thingy attached? Angled screw I reckon. Looks like a nice clean cut into the horizontal grip. Oh the mods, the mods. ...the oustol grip up to the part that seats the rwar if the receiver. Trying to follow you with the Garand stock thing, but your description of the Garand stock leaves a little bit to be desired. I think I got the oustol thing, but the rwar left me baffled. Its definitely a staged photo. Look at the Bolt position on the M1. Me too, but this is what I think he means, and I respectively disagree. I think hes trying to say that the grip was cut from a M1 Garand stock. The back part of the grip that is closest to the magazine and mated to the horizontal grip is where the receiver heel would mount and the muzzle side of the grip would be where the trigger housing is inserted. Then some creative shaping and you get this weird grip. As I mentioned, I disagree and do not believe it was shaped from a garand stock. It looks off shape-wise to me. But I dont know much. Can anyone ID the radio? Possible to date time frame to picture as to when that radio came on line. I don't think the photo is staged, their clothing is tattered, besides a Thompson carrier wouldn't necessarily have the bolt back if he were somewhat back from and initial contact area.... to much crap can get inside the gun when the mortars and other crap comes flying in. On the forearm mod, if you look closely, you can see where on the horizontal forearm area, the attachment area has been sanded or shaved flat to accommodate the grip. Totally wild design for I'm assuming a particular reason. Its design lends itself to be thrown onto a resting bar or such on some kind of vehicle to enhance one handed operation while driving or riding. Photo is on page 135 of The Thompson Submachine Gun book by author Tom Laemlein. Notes at the page bottom. Edited by Bridgeport28A1, 11 October 2018 - 10:00 PM. More often than not the bolts were left closed while not in a firefight. They would do this to keep dirt and debris out of the action. That improvised grip is set farther back than any other I can recall seeing. Usually they stuck them in roughly the position where factory forward pistol grips would be. I wonder how it's attached. Something funny in the shadow in front. Could it be directly attached to the grip mount, instead of to the horizontal handguard? Edited by richard w., 12 October 2018 - 08:18 AM. Tom Laemlein's book The Thompson Submachine Gun is all photographs of Thompsons. Many of the photographs are not observed elsewhere. It is one of David Albert's recommended Thompson books from his TATA Show and Shoot lecture. Unfortunately it is out of print and is not the the easiest to locate on the secondary market. The vertical portion of the banana shaped grip on the 1928 appears to have been neatly inletted into the horizontal grip. Maybe there is a long wood screw or two that is countersunk down through the horizontal grip securing the banana shape vertical portion. Edited by Bridgeport28A1, 12 October 2018 - 09:35 AM. Sorry about the spelling folks! I have a rogue spellcheck or auto correct that switches stuff around on me. Unless I go over every word before posting it goifs some up. I cant figure iut how to turn it off...Its a cheap Kindle Fire tablet. The keypad probably needs calibration too but some letters are spot on and some are 1/4" off! No way I can find to xalibrate the thing either. Looking again, may be closer to an 03 or an Enfield....but not the "scant stocks". Nice work, though. The guy on the right looks like Robert Mitchem's son. I'd guess that this improvised vertical grip is either dovetailed into the rear of the horizontal foregrip, or there is a screw or screws going into the grip from inside the barrel channel. My carpenter's instincts tell me that there is no good way to attach this appendage by going through it into the horizontal grip.